Fridays were meant for PIZZA! That’s why we’re bringing $5 Fridays to our Las Colinas location. 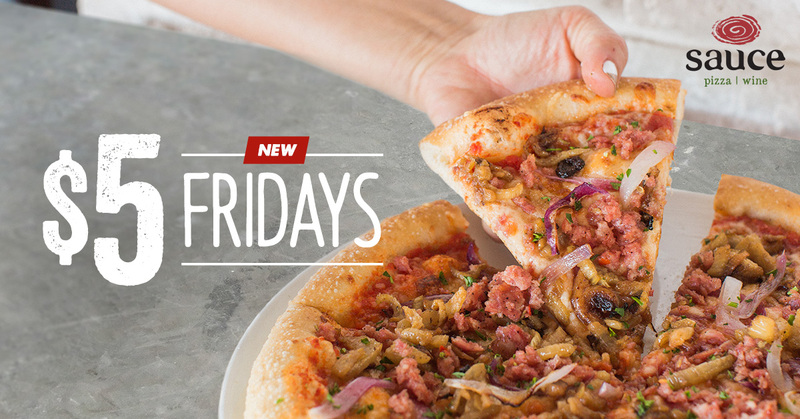 Every Friday, stop by for a $5 entrée, which includes any pizza, pasta, salad or panini ($10 or less). Get Directions to Sauce Las Colinas! Plus, right now, if you order your first catering pack from our Las Colinas location, you will get 20% off! See our catering menu. Offer includes any pizza, pasta, salad or panini ($10 or less). Cannot be combined with any other offers or discounts. Limit one offer per guest per visit. Valid at Sauce Las Colinas location only. Limited time offer. Valid for dine-in only.